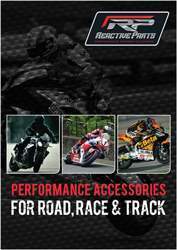 Protecting your motorbike should be a priority when buying accessories to improve your performance on track. Evotech radiator guards are superb for use on road and track and is so much cheaper than having to replace your radiator. Also in the range is oil cooler guards, exhaust hangers and much more. We use Evotech products here at Reactive because they are so easy to fit and don't require any modifications to your bike. These top spec motorcycle protector guards are a winner in our eyes.